It is the largest municipality in terms of land area and population in the province. It is the commercial, educational, financial, political and government center of the province. It lies on the northern part of Samar Island, bounded to the east by Mondragon, to the west by Bobon, to the south by Lope de Vega, and to the north by the Philippine Sea. On the Pacific coast are flat lowlands with the interior characterized by outlying low hills. Mount Puyao in Barangay Liberty is the highest peak in the area. The Catarman River, a major provincial river, divides the eastern and the western parts of the town. It is fed by the Paticua, Hibulwangan, Mahangna, Tura, and Danao creeks together with lesser prominent estuaries. The Municipality of Catarman is politically subdivided into 55 barangays, 17 of them in the poblacion. Before the coming of the Spaniards, Catarman (Calatman) or (Cataruman) was a settlement by the mouth of the river of the same name in the region called Ibabao. The Spanish Conquistadores freely applied the name Ibabao to the northern part of Samar island when it established its civil government. The similarities in the vocabularies and pronunciation of the dialects of these areas traces them to a common root as a people. The town was one of the 13 villages and settlements and adopted as pueblos by the Spaniards in Samar Island and was one of the settlements in the northern parts of the island. The pueblo was named Calatman and was one of the pueblos in the Visayan islands, then collectively referred to as Islas de Pintados. Test Edit. In 2003, its application for cityhood was deterred after officials of the neighboring of towns Bobon and Mondragon opposed the planned Catarman City conglomeration, which was necessary to meet the criteria for the approval of its bid for cityhood. Another bill was filed converting the Municipality of Catarman into a component city of Northern Samar but is still pending with the Committee on Local Government in the House of Representatives since July 2010. The rise of establishments and banking institutions has swiftly came and filled the spaces of Catarman that paved the way for it to become competitive. There is only one airline operating through the Catarman National Airport ( IATA: CRM) coming from and going to Manila: PAL Express. Flights are frequently booked out well in advance and a one way ticket from Manila costs between PhP3,000 and PhP8,000 unless booked well in advance. Pedicabs, commonly known as "padyak" and tricycles are the means of transportation within the town, while multicabs, jeepneys, and vans are the means of transportation to neighboring and distant towns within the province. Several taxi and bus companies are also operating from the town going to Manila or Tacloban city and vice versa. Catarman is home to the University of Eastern Philippines, the first state university in the visayas and the largest university by student population and curriculum in Eastern Visayas. The University has satellite campuses in the province, one in Laoang and the other in Catubig (officially known the Pedro Rebadulla Memorial Campus), and has several extension programs offered across satellite campuses in the region. Catarman is also an abode to the top performing schools in the region which already have a name in the National Level. The beach is located in the Sila Island and is considered as one of the best beaches in the country due to its unique pink color of the sand. The fragments of red corals and different shells mixed with the white sand is what makes it color pink in appearance most especially when the rays of the sun touches the shore. The island's long stretch of white sand with planted palms on the side makes the place famous. It is rich with marine resources and ideal for instant swimming and snorkeling sessions. The island is a 30-minute boat ride from the town of Victorina. The beach is located on the North-eastern Coast of Northern Samar which is famous for its golden sand beach color that stretches up to the total length of one kilometer. The 101-foot lighthouse was built during the American Occupation back in the year 1907 and is one of the top historical places of Samar. The falls is considered as one of the top tourist spots in the Northern Samar. It is 2 kilometers away from the actual town. The water coming from the falls pours down to the two huge vertical walls of rock formation going to the bottomless plunge pool making it ideal for swimming as well as cliff jumping. ^ "Catarman, Northern Samar Climatological Normal Values". Philippine Atmospheric, Geophysical and Astronomical Services Administration. Archived from the original on 11 October 2018. Retrieved 11 October 2018. ^ "Catarman, Northern Samar Climatological Extremes". Philippine Atmospheric, Geophysical and Astronomical Services Administration. Archived from the original on 11 October 2018. Retrieved 11 October 2018. 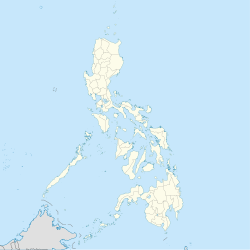 Wikimedia Commons has media related to Catarman, Northern Samar. Wikivoyage has a travel guide for Catarman.